You know how your life's been kind of purposeless lately? How you've been thinking that nothing matters, and why bother going on? Boy, are you in luck. 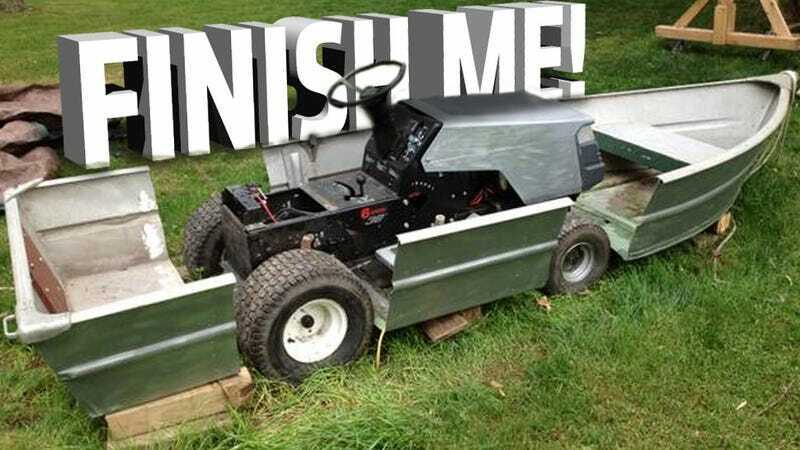 Once again, Uncle Craig has the answer, and it's this half-finished amphibious riding mower. You're welcome. We all know that feeling of mowing a lawn on a riding mower and thinking, If only I could just drive this into the sea! Why, I could be mowing Neptune's own backyard! Clearly, the Lansing, MI-area resident who started this knows that feeling, which got ahold of him long enough to cut an aluminum rowboat up into three sections and park a riding mower in the middle of the bits. The basic plan looks pretty clear from the pictures, and the seller "can show how to make it work" so I'd expect zero problems making this mower seaworthy. The boat will need to be rebuilt with wheel wells for the wheels, and some manner of port for the axles to pass through, but I don't see how that would cause any tricky sealing issues. There's also the issue of propulsion in water, which isn't really clear at this point. Options include some sort of propeller driven from some sort of unseen power take-off from the mower, or maybe a big paddlewheel, belt-driven off the rear axle, or maybe a big pulse jet (buyer provided). The buyer's not sugarcoating these issues, reminding readers that it will take "motivated person and fabricator to finish it." The mower appears to have a grass-and-water shredding 12.5 HP motor, which I'm guessing is plenty for going from the lawn to pulling a pyramid of adoring ladies on waterskis. Just keep focused on the end product: an incredible, amphibious vehicle that won't be legal to drive on roads, and should be delightfully slow and cumbersome in water. In short, the best of all worlds. The seller admits that another boat project (combine and catamaran? Airport luggage tow submarine?) has his attention now, but if you're willing to part with "coins, silver, gold... and many other things" you can pile the half-stripped riding mower and rowboat chunks in your hatchback and begin your new life full of purpose. Now where'd I stash that sack of Kruggerands? Under the jar of kidneys?